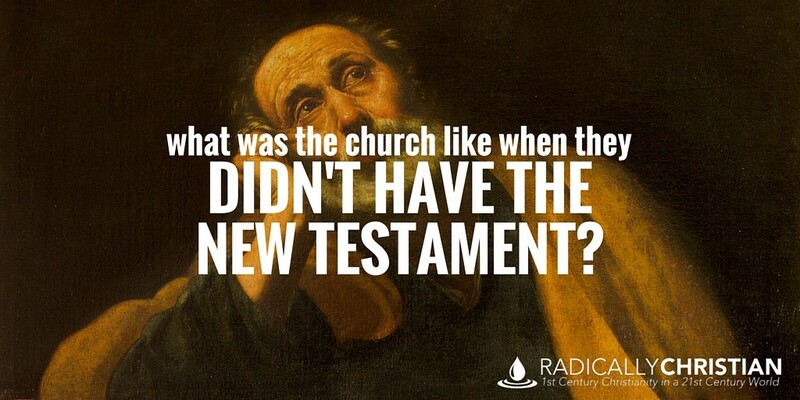 What Was the Church Like When They Didn’t Have the New Testament? I received a very thought-provoking e-mail recently from a blog reader who asked about a subject which doesn’t receive much consideration. He asked, “How does the church of Christ claim (or at least imply) to be something like the first century church, when the first century church didn’t really have the New Testament like we do today?” That’s a great question and there was certainly a period of time when no one had access to all 27 books of the New Testament, so let’s consider what the church was like then. Sometimes we talk about being the church of the New Testament or we talk about being like the first century church. We certainly don’t mean we want to repeat the sins of the church in Corinth or accept a false gospel like some of the churches in Galatia. We don’t think the churches of the first century were perfect. When we say we want to be like the church of the first century, we’re saying that over the last 2,000 years, paganism, Catholicism, denominationalism, and countless other influences have caused Christian theology and practice to evolve into something that is not the same as the Christianity practiced in the first century. When we say we want to be like the church of the first century, we’re saying we want to go back to the New Testament to find out what Christians are supposed to do and believe. But, as this recent e-mail pointed out, the church of the New Testament didn’t actually have the New Testament yet. The church in Corinth, for instance, had the letters Paul wrote to them and they may have even had a couple of other letters that had been copied and shared with them, but they probably didn’t have access to all 27 books of the New Testament during the first century. So, if our authority comes from the New Testament, from where did their authority come? How did they determine what they were supposed to be doing? From the very beginning of the church, Christians understood that if they wanted to know the will of Jesus they must devote themselves to the apostles’ teaching (Acts 2:42). The apostles were Jesus’ official representatives. They were guided by the Holy Spirit into all truth (John 16:13). The Holy Spirit brought to their remembrance all that Jesus had taught them (John 14:26). They had the mind of Christ (1 Corinthians 2:16). When we say we want to be like the first century – New Testament – church, we’re saying we want to devote ourselves to the apostles’ teaching. Paul said in Ephesians 4:11-12, “[Jesus] gave the apostles, the prophets, the evangelists, the shepherds and teachers, to equip the saints for the work of ministry, for building up the body of Christ.” This is an important list. In addition to the apostles, who were miraculously carried along by the Holy Spirit, there were also other prophets through whom the Lord spoke.But the apostle Paul warned the Corinthian church that these miraculous gifts would soon pass away. He wrote, “As for prophecies, they will pass away; as for tongues, they will cease; as for knowledge, it will pass away” (1 Corinthians 13:8). I believe these gifts passed away when God’s entire will had been revealed through the apostles and they had written all 27 books of the New Testament. But while these gifts lasted, the first century church was able to hear prophetic messages from the Lord. But it wasn’t just apostles and prophets that taught the first century church what to do and what to believe. The apostles trained evangelists, men like Timothy and Titus. They sent these evangelists to congregations to teach what had been taught to them by the apostles. These men were to “reprove, rebuke, and exhort” the church (2 Timothy 4:2). They were to appoint elders in every congregation (Titus 1:5). And they were to take what they had heard from the apostles and “entrust to faithful men who will be able to teach others also” (2 Timothy 2:2). Today’s evangelists, who devote themselves to learning the apostles’ doctrines and passing them on to others, are following in the footsteps of these first century evangelists. We no longer have the apostles, but we have their teachings in the pages of the New Testament and we still need evangelists who will share their message, the message of Christ. Evangelists and shepherds still play an important role in the church, but they especially played an important role in an age when the New Testament was still in its formation. But just because we all have a copy of the New Testament, does not give any of us the right to ignore the God-appointed authority structure of the church. And we cannot forget that the first century church wasn’t completely without Scripture. They still had the Old Testament Scripture. They would read the Old Testament publicly in their assemblies (1 Timothy 4:13). They would preach from it and teach from it. They would teach Christians how Jesus was their high priest, how He was the atoning sacrifice for their sins, how the church was the new Israel, and how they ought to imitate the faith of Noah, Abraham, Moses, Daniel, and others (Hebrews 11). Finally, the church also had New Testament Scripture. They may not have had the entire New Testament, but when you consider everything else they had at their disposal, one or two books would have been a great blessing. I imagine when a church – like the church in Ephesus – received Paul’s letter, they not only copied it and sent it on to other churches, but they also read the letter over and over again, cherishing every word. “And count the patience of our Lord as salvation, just as our beloved brother Paul also wrote to you according to the wisdom given him, as he does in all his letters when he speaks in them of these matters. There are some things in them that are hard to understand, which the ignorant and unstable twist to their own destruction, as they do the other Scriptures” (2 Peter 3:15-16). We are so blessed to have the entire 27 books of the New Testament together with such great availability today. And if we want to be the church that belongs to Jesus, we must do what they did after Pentecost, devote ourselves to the apostles’ teaching.